My grandparents farm had lots of fresh strawberries to pick. The strawberries would rarely last long enough to bake . I would say the same holds true today. 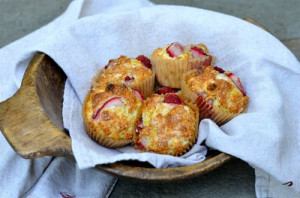 But if you do find yourself with some berries this is the perfect morning treat. A moist muffin that is not too sweet. It’s the perfect start to a nice relaxing weekend morning! From by the bay , wishing you berry food memories! Preheat oven to 400 F. Take a 12 muffin pan and line with paper baking cups. Put tin to the side. In a bowl combine flour, 1/4 cup sugar, salt, baking powder, baking soda and lemon zest. Add melted butter, ricotta cheese and stir. Add the eggs to the buttermilk , mix and pour into the flour mixture and combine. 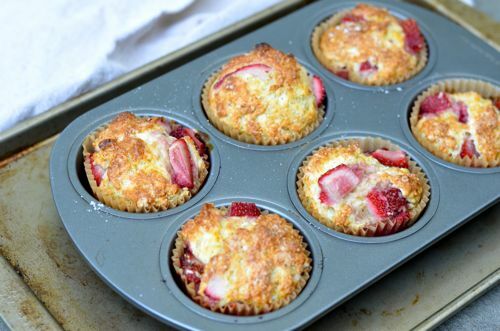 Add strawberries, mix and then fill each muffin liner about 3/4 filled. sprinkle tops of muffins with remaining sugar. Place tin on baking sheet and bake on the center rack for 20 to 25 minutes until cake tester comes out clean. Cool 5 minutes then remove muffins to wire rack to cool. Serve warm or room temperature. This entry was posted in muffins and tagged baking, egg recipes, muffin recipes, ricotta recipes, spring food, spring recipes, strawberry recipes on June 12, 2014 by entertainingbythebay. I recently had dinner with a good friend of mine at Franny’s in Brooklyn. Over a great bottle of wine we shared a few dishes and this one was a seasonal standout. We enjoyd the roasted asparagus topped with a creamy and nutty pine nut dressing, egg and croutons. Here is my take on a memorable dish. It may seem as if this is a lot of steps, but they are all little simple ones and the results are delicious. You could double the recipe and it make it the star dish of the evening and serve it with something simple off the grill. From by the bay, wishing for Franny-like food memories! To make the egg, place in small sauce pan and cover with cold water. Bring to a low simmer for 1 minute. Remove from heat and cover. Keep covered for 10 minutes. Remove egg from the pan and place in an ice bath or cool under cold water. Set aside. Preheat over to 400 degrees F. Place bread on baking sheet and brush both sides with 1/2 teaspoon olive oil. Place in oven for 5 minutes until one side is brown, turn over for another 3 to 5 minutes until brown. Remove from oven and cool. Pull bread apart into large pieces to make croutons. Clean and trim stems of the asparagus and place on baking sheet. Drizzle asparagus with remaining 1 1/2 teaspoons olive oil. Sprinkle with 1/4 teaspoon salt and 1/8 teaspoon fresh ground pepper. Place in the same oven for about 15 minutes until the asparagus are tender and start to brown. Place asparagus on a serving platter. Remove from oven and cool. Place a small dry pan with pine nuts over medium heat until the nuts start to brown. Remove from heat and cool. Take 1 tablespoon of the toasted pine nuts aside to garnish. To make dressing place the remaining pine nuts go into a small food processor. Add 1/4 cup olive oil, vinegar, 1/4 teaspoon fine sea salt and pulse until blended and creamy. 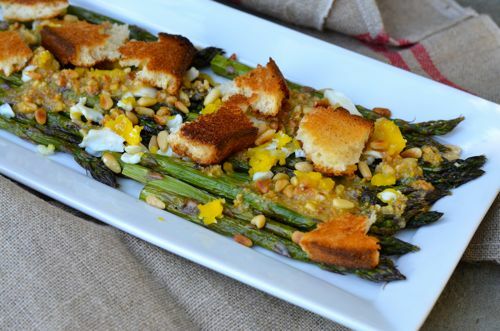 Peel egg and break into small pieces over the asparagus, then drizzle dressing and add croutons and remaining toasted pine nuts. Serve immediately at room temperature. 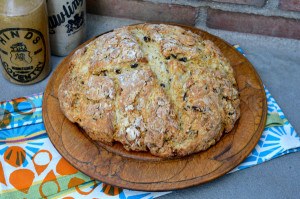 This entry was posted in side dish and tagged aparagus recipes, Brooklyn, egg recipes, Frannie's Pizza, pesto recipes, pine nut recipes, salad recipes, spring food, spring recipes on June 5, 2014 by entertainingbythebay. I’ve gone pea wild! I love spring when fresh peas start to show up in abundance. I was shopping in my favorite food market and found both english peas and sugar snap peas. Of course I couldn’t decide on which to buy, so I bought both and decided to celebrate with a little pea fest in the kitchen. First up is this yummy pizza, make with 3 cheeses and then topped with peas and ham one of those perfect duets in food. I opted for the italian version of this combo and used prosciutto. I wanted to kept the peas fresh, crisp and vibrant green so I decided to blanch them and toss then over the pizza once it came out of the hot oven. The last touch is grating some fresh lemon zest on top to brighten all the flavors. 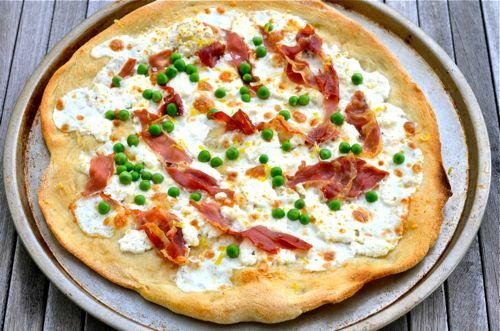 This is a pizza you’ll want to try as soon as you find some fresh peas, but if you can’t find fresh peas, you can blanch some frozen baby peas and they will work just as well. Enjoy! From by the bay wishing you pea green food memories! Make pizza as directed below. Blanch peas, by tossing into boiling water for 1 minutes, then strain the peas and place in ice water to stop cooking. Once cooled, strain and dry and set aside as a pizza topping. Once pizza dough is rolled out top with ricotta, mozzarella, grated cheese and strips of prosciutto. Bake as directed. Before serving sprinkle with peas, lemon zest and some coarse sea salt. Serve immediately. 1. In a large bowl, mix the flour with the yeast and salt. Add the water and stir until blended (the dough will be very sticky). Cover the bowl with plastic wrap and let rest for 12 to 24 hours in a warm spot, about 70°. 2. Place the dough on a lightly floured work surface and lightly sprinkle the top with flour. Fold the dough over on itself once or twice, cover loosely with plastic wrap and let rest for 15 minutes. 3. Divide the dough into 4 pieces and shape each piece into a ball. Generously sprinkle a clean cotton towel with flour and cover the dough balls with it. Let the dough rise for 2 hours. 4. Stretch or toss the dough into the desired shape, cover with toppings and bake on top of a very hot pizza stone or on a oiled baking sheet in a 500 degree F oven for about 8 to 10 minutes until dough is cripsy and golden brown. This entry was posted in Pizza and tagged Jim Lahey, no knead pizza dough recipes, pea recipes, pizza recipes, proscuitto recipes, ricotta recipes, spring food, spring recipes on May 25, 2014 by entertainingbythebay. I love looking for inspiration and sometimes the source can be surprising. 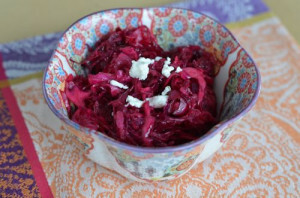 Such is the case for this delicious slaw made of beets and red cabbage. Both ingredients were left over from “experiments” with natural dyes for color Easter eggs a few weeks ago. I decided to combine the ingredients with really fantastic results for a modern twist on a traditional classic. The color is vibrant and the taste is crisp and fresh. This will definitely be a a go to side dish for many of my summer barbecues. From by the bay wishing you vibrant food memories! Place red cabbage and grated beet into a bowl. In a medium sauce pan add the oil, vinegar and sugar and bring to boil until the sugar is dissolved. Pour the hot dressing over the cabbage and beet, add salt and pepper and mix well. Let stand for 1 hour at room temperature before serving or cover and place in the refrigerator until ready to serve. Sprinkle the crumbled goat cheese on top of your salad right before serving. This entry was posted in salads, side dish and tagged beet recipes, cabbage recipes, goat cheese recipes, red cabbage recipes, slaw recipes, spring food, spring recipes on May 25, 2014 by entertainingbythebay. While planning a menu for my Easter brunch by the Bay, I was looking for a clever way to serve carrots with a nod to our small bunny friends. 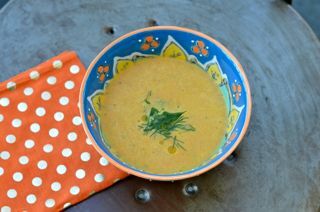 I decided on this delicious and easy carrot soup. The color is a wonderful vibrant orange. The soup is a feast for the eyes and mouth, with the slightest under note of heat to contrast the slightly sweet taste of the carrots. This soup is great served warm with a dollop of creme fraiche which just melts into the soup or cold with a drizzle of olive oil. Sprinkle fresh chopped dill on top for either version. You can serve the soup in bowls or in little shot glasses. The bottom line is this soup is great no matter how you eat it! 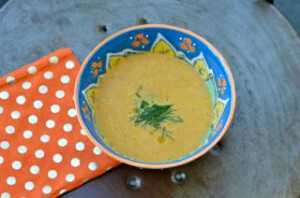 Enjoy this springtime soup! 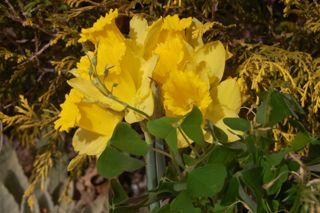 From by the bay wishing you – springtime food memories! In a large soup pot heat butter and oil, add leeks and sauté until soft about 5 minutes. Add chili flakes and carrots, sauté for another minute. Slowly add the chicken broth, salt and pepper. Bring to a boil and then simmer for 30 minutes uncovered until the carrots soft. Puree in food processor until very smooth. Stir in lemon juice, dill and heavy cream. Serve soup either hot or cold. Garnish with chopped dill and a drizzle of olive oil or a dollop of creme fraiche. This entry was posted in soups and tagged carrot recipes, chilled soup recipes, creme fraiche recipes, dill recipes, soup recipes, spring food, spring recipes, vegetarian recipes on May 25, 2014 by entertainingbythebay. I like to welcome Spring with food. 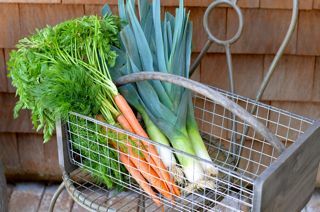 Two of the first vegetables to make their appearance at the farmstands are bright green pencil thin aparagus and vibrant red/pink radishes. My favorite way to to eat both are fresh and raw. 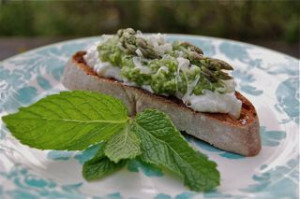 Here are two easy appetizers to make at the first sign of Spring. Enjoy! Clean asparagus, remove the tender tips and place to the side. Snap off woody stems and discard. In to food processor add asparagus stalks broken into pieces and coarsely chop. Add the following to the asparagus: mint, olive oil, lemon juice and 2 tbs. grated pecorino. Pulse a few times. In a separate bowl combine the ricotta cheese, lemon zest salt and pepper. On hot toasted ciabatta bread layer the ricotta cheese, puree asparagus, grated pecorino cheese. Drizzle lightly with olive oil and add asparagus spear to the top. Clean radishes and using a mandoline slice the radish into rounds. Keep radish slices in iced water until ready to use. In a 400F degree oven, place 4 slices of ciabatta bread on a baking sheet in the oven until the bread starts to brown, flip bread over and toast the other side, 2-3 mins per side. 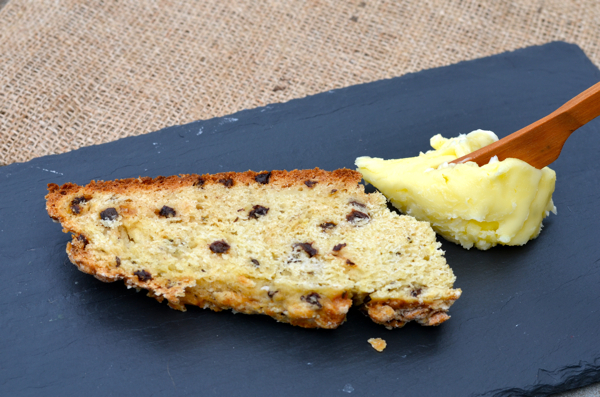 Let toasted ciabatta bread cool a little, then spread with the best salted butter you can buy. 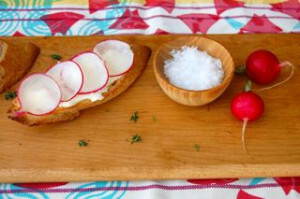 Take radish slices out of the water and dry with a paper towel before layering the rounds on top the bread and butter. Sprinkle with coarse sea salt and serve. This entry was posted in appetizer and tagged asparagus recipes, citrus recipes, cocktail party recipes, radish recipes, spring food, spring recipes, spring vegetables on May 24, 2014 by entertainingbythebay. I officially have Spring Fever! Outdoors the days are becoming longer and lighter, the weather is warmer, my spring bulbs are all sprouting and the pansies are planted . Indoors, I have tucked away my winter pillows and throws and have brought out my brighter ones in happy colors and lighter weight fabric, I have filled a bowl with bright citrus fruit and have shopped the product aisle looking for all those wonderful spring vegetables that start to appear this time of year. My latest trip “down the aisle” turned up the following: fresh english peas, baby carrots, sugar snap peas, red baby pearl onions and asparagus. 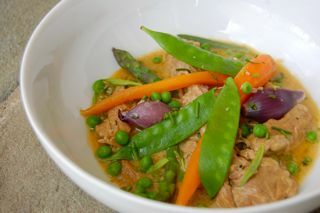 I used all of these vegetables in this wonderful veal blanquette recipe. It’s become one of my spring traditions to make veal blanquette. Veal blanquette is a french dish in which the veal meat is stewed in broth , the veal and the butter is never browned. It’s a perfect dish to welcome Spring! From by the bay , wishing happy spring food memories! Melt 8 tablespoons butter in heavy bottomed casserole on medium heat. Saute the veal one minute per side, cooking the veal from pink to white without browning. Add to the casserole the stock, 3 springs of tarragon and bay leaves. Bring to a boil, reduce heat and simmer for 1 1/2 hours, until veal is fork tender. While the veal is cooking blanche your vegetables . Once the veal is cooked, remove veal into a bowl and strain broth in a another bowl. Place the empty casserole back on to medium heat and melt the remaining butter, once melted add the flour and cook for 2 minutes stirring, Whisk in the broth along with the veal demi glace and cook until thickened. Stir in the cream, lemon zest and juice, salt and pepper to taste. Ina big bowl or platter top veal with sauce and mix. Toss the vegetables over the veal, sprinkle with chopped chives and tarragon and serve immediately. This can be served as is or with small new boiled potatoes. Bring a large pot of water to boil, Have a large bowl of ice water ready and a strainer to remove vegetables from boiling water. You will cook each vegetable separately in the same pot of boiling water and use the strainer to remove and place into the ice bath. The peas and sugar snap peas will take 1 to 2 minutes, the asparagus and baby carrots will take 3-4 minutes depending on size. You are looking for the vegetables to be slightly tender, yet bright in color. Lastly, boil the pearl onions, then strain and rinse with cool water. Let the onions cool off , then pop them out of their skins. Strain vegetables out of the water and keep in a bowl to the side until ready to add to the blanquette. This entry was posted in main dish, veal and tagged asparagus recipes, carrot recipes, pea recipes, spring food, spring recipes, sugar snap pea recipes, veal recipes, vegetable recipes on May 24, 2014 by entertainingbythebay. Celebrate Spring with this minty fresh salad using early spring vegetables- peas and ramps. This salad is lightly dressed with a little olive oil and champagne vinegar so that the taste of the fresh vegetables shine through. From by the bay wishing you minty food memories! Trim roots from ramps; finely chop white bulbs. Slice green leaves into 1/4-inch strips. 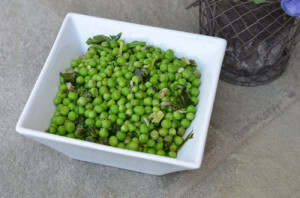 Blanche peas by adding into a pot of boiling water for 1 minute, strain and place into a bowl of ice water to stop cooking. Once cooled, strain peas and place into a bowl. Heat 2 tablespoons olive oil in a large pan over medium heat. Add white part of ramps and cook 1 minute. Add ramp greens and saute until greens are slightly wilted about another minute. Remove from heat and add to peas. Stir in remaining olive oil, vinegar, salt and pepper to taste. Add mint and toss. Serve immediately or at room temperature. This entry was posted in recipes, side dish and tagged fresh vegetables, green vegetables, mint recipes, pea recipes, ramp recipes, spring food, spring recipes, vegetarian recipes on May 1, 2014 by entertainingbythebay. This buttery pound cake is filled with the taste of fresh citrus for tang and green pistaschios for crunchy texture. This cake looks and taste like the sunhsine in Spring. Enjoy this dessert and say good bye to winter!! No looking back.From by the bay wishing you tangy citrus food memories! Arrange a rack in middle of oven; preheat to 325°. Coat a 9x5x3″ loaf pan with nonstick spray. Dust pan with flour; tap out excess.Whisk 2 cups flour, salt, and baking powder in a medium bowl. Using an electric mixer, beat butter on medium speed until light and fluffy, 2–3 minutes. Add sugar; beat until well incorporated, 1–2 minutes. Add eggs one at a time, beating to blend between additions. Add juices and zests; beat until well combined (mixture will look curdled), 2–3 minutes. Add dry ingredients; reduce speed to low and beat just until blended. Fold in 3/4 cup pistachios. Pour batter into prepared pan; smooth top. Sprinkle remaining 1/4 cup pistachios over.Bake cake, rotating halfway through, until a tester inserted into center comes out clean, about 1 1/2 hours. Transfer to a wire rack and let cool completely in pan. Run a sharp knife around sides to loosen; unmold cake. DO AHEAD: Can be made 1 day ahead. Store airtight at room temperature. This entry was posted in cakes, desserts and tagged baking, butter recipes, citrus recipes, egg recipes, lemon recipes, lime recipes, orange recipes, pistachio recipes, pound cake recipes, spring food, spring recipes on April 10, 2014 by entertainingbythebay.